To connect/disconnect the CITY function, push the button located on the central tunnel . 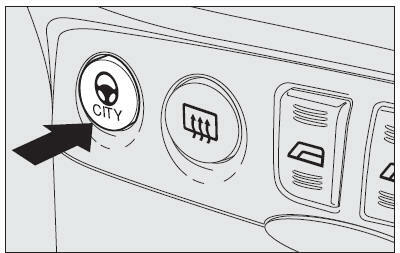 Activation of this function is indicated by the word CITY on the instrument panel (see figures beside). When the CITY function is on the steering wheel effort is lighter and thus parking operations are easier: therefore this function is particularly useful for driving in city centres. Additionally, in Sporting versions, this function ensures a more comfortable drive by gradually dosing the accelerator pedal, suitably calibrated for acceleration and deceleration.